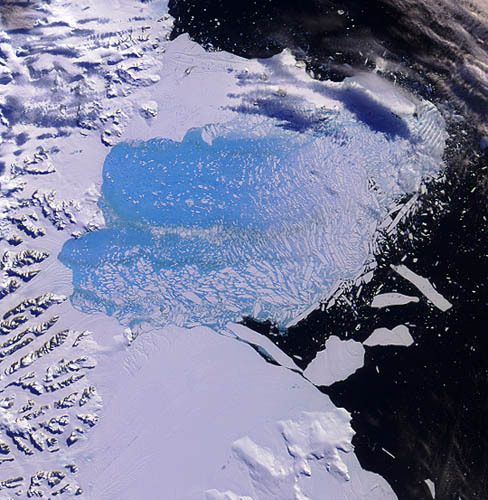 In February-March 2002 the Larsen B ice shelf, a mass of floating ice some 220 meters thick and larger than Rhode Island, broke up into icebergs. The flow of glaciers held behind the ice shelf accelerated. The ice shelf had probably existed since the last ice age. This was only the largest in a 30-year series of retreats of ice shelves along the Antarctic Peninsula, the only part of the continent that scientists had predicted would be affected soon by greenhouse warming. Image courtesy Ted Scambos, National Snow and Ice Data Center, University of Colorado, Boulder, based on data from MODIS, courtesy NASA Earth Observatory.